Quality, style, and durability define this widely renowned glassware and dishware brand. Manufactured by no less than the leading kitchenware product maker and distributor World Kitchen, LLC, Corelle Coordinates has established a respectable place in the market as a trusted and highly patronized brand. 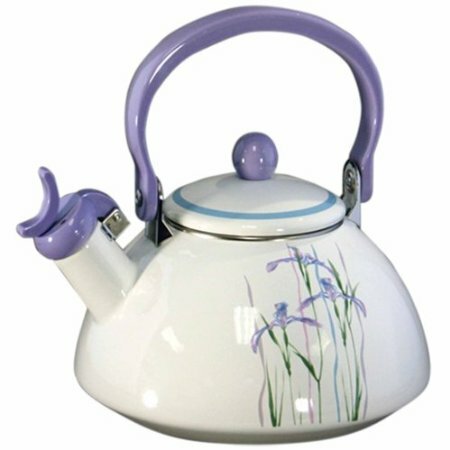 Among the great collection of kitchenware products that are marketed under this prestigious brand are the Corelle Coordinates Teapots and Kettles. Corelle’s kitchen accessories strike an exquisite balance between substance and aesthetics that can certainly add touches of elegance and refinement to your current kitchen set. With a holding capacity of 2.2 quarts and enamel on steel container body, this sturdy piece is one must-have kitchen masterpiece. Inspired by a Coastal Breeze design theme, its remarkable features include a harmonic hum whistling, an admirable material strength and staying power, and an easy to maintain vessel. Its sleek Bamboo Leaf print inspiration and its functional components create quite a magnetic blend that can draw any curious home owner. Perfect for an adorable gas or electric stove, this charming addition to your kitchenware collection, banks on its commendable grit, top-of-the-line material composition and proven efficiency. The neat, simplistic, and classic appeal of this collection create a visual package that can win the attention of any vintage lovers. Its country cottage design scheme can blend easily with various kinds of kitchen interior themes and its well-defined lines and curves can easily impress a passionate home buddy. With its dynamic functionality also comes its decorative characteristic that can bring a radiant vibe to any cooking and dining haven. 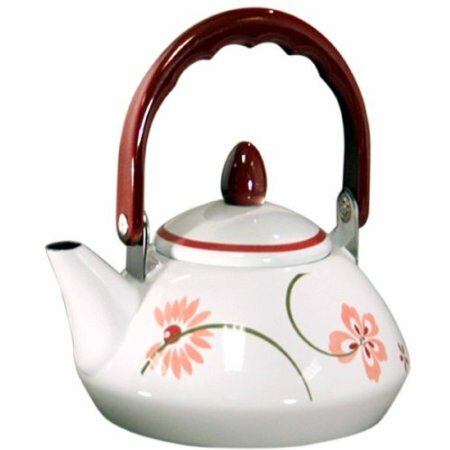 Its enamel on steel offers a 1.2 quart capacity to cater to varying needs and its attractive features include a heat resistant handle and a visually pleasant and entertaining Pretty Pink design pattern. The inviting aura of the autumn is being creatively presented on this cute and captivating tea kettle line. With lush and luscious fruits showcased in such a fluid and alluring fashion, it effectively exudes ideas of fine food and healthy living combined with a tasteful classic elegance to give any kitchen an inviting atmosphere. 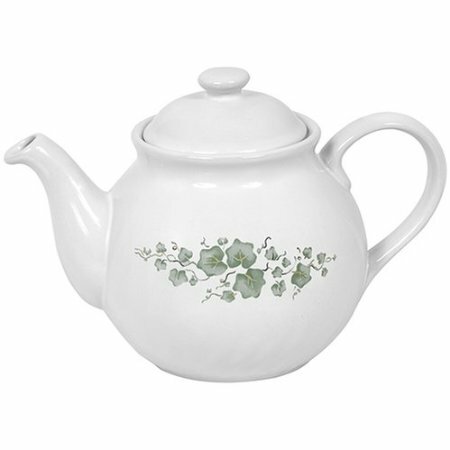 Minimalism and refinement best describes this classy teapot collection with its design featuring lasting prints and elegant curves, and is safe for dishwashing. Its shape having smooth and ripple-like ridges, polished rims, and rounded corners, produce an interesting combo that can readily attract the eyes of an avid shopper. 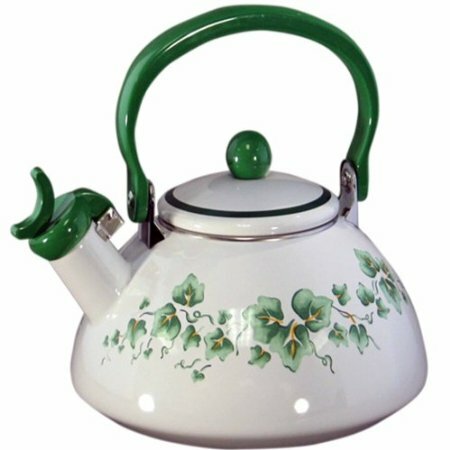 To add flair and vigor to any kitchen set is this sophisticated tea kettle which proudly showcases a floral pattern in a charming pale green shade. To add to its striking aesthetic is its delicately sculpted rim and its sturdy vessel which not only emanates reliability but also exhibits industry standard efficiency and functionality. 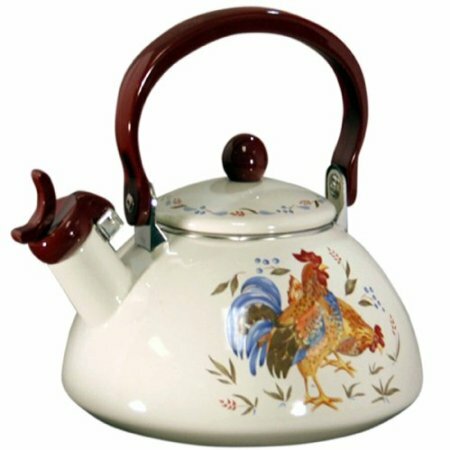 Invite the positive vibe of a bountiful fall harvest with the enticing design print featured on this whistling teakettle line. Its design, which is an interesting mix of delish fruits and green touches that can go well with varying home décor themes, backed with its quality material components, can justify the value of every shopper’s money. The magic that a purple tint creates is very well demonstrated through this collection. 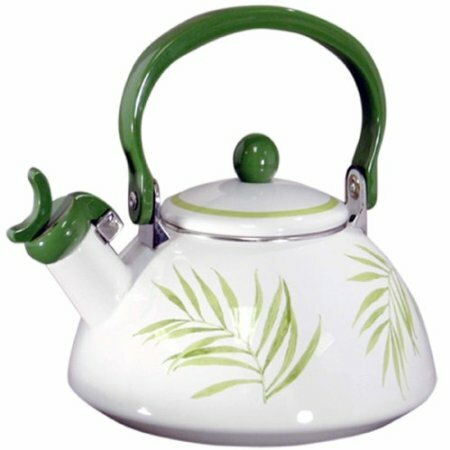 Featuring the Shadow Iris design motif, this tea kettle cannot only bring a vibrant and tasteful aura to just about any table setting, but it can also satisfy the requirements of a picky and particular modern home maker in terms of function and practicality. Feel the comforting vibe of a warm and cozy country morning through the featured design of this stunning tea kettle line. 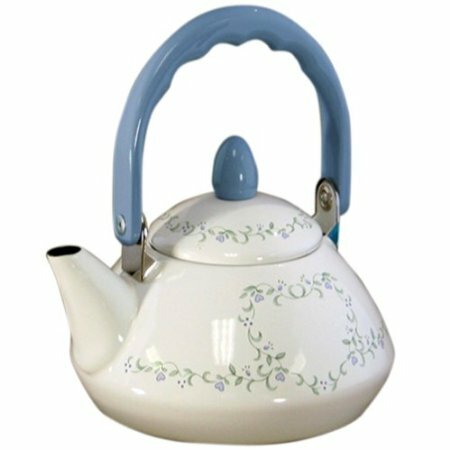 This porcelain-on-steel kitchenware appeals to the strict standards of today’s home owners through its impressive features which include a harmonic hum-whistle, a heat resistant handle, and a 2.5 Quarts capacity ideal for water heating needs. 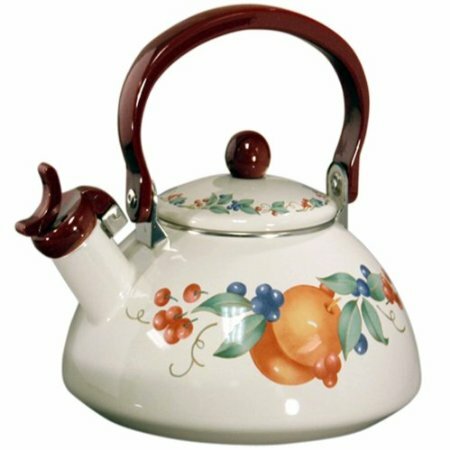 So, given this brilliant teapot and tea kettle line up, what’s with the delay? Go get those shopping carts moving and start filling them in! Whether you are looking to buy an electric kettle or a teapot, whether you want to compare various brands or even when you want to see which model from one specific manufacturer is the best, the TheTeaSupply.com reviews will get you to the most viable conclusions. Check out all the tea product reviews from the TheTeaSupply.com!